That's amazing! Can the graphic be uploaded? Wow - how much for one sent to UK? probably can't afford it but good to know. !!!!!!!!!!!!!!! What archive did you rob?! Did not rob anyone. They begged me to take these off their hands. But I guess the price itself, low as it was, could be considered a robbery. I'm going to have to ask - the two in the middle are from different publishers to those on the outside. Any interesting differences? It's astonishing how people look for these kind of details. I usually do that myself. You really made me check twice on this. But no, there is no difference, it's just the different sides on the boxes. 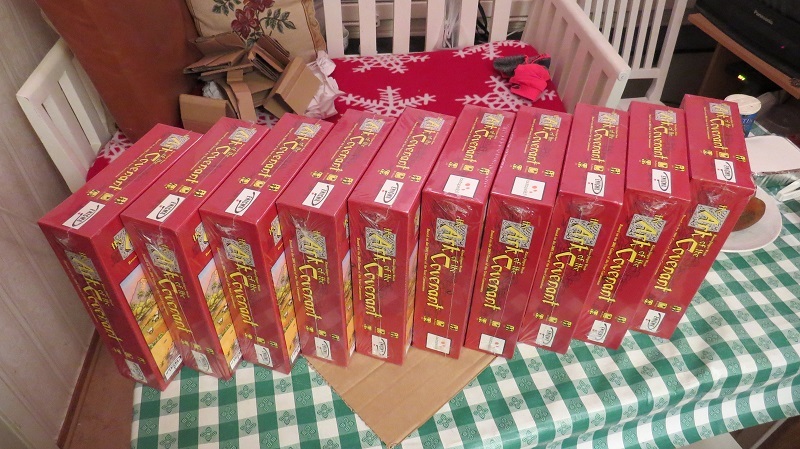 EDIT: By the way, are these for the benefit of Carcassonne Central members? If so, how many have already been claimed? now my collection is almost finished!!! Yellow, how much for a copy? What a find; I thought I looked everywhere for that, even a strange toy shop in China. I got a lucky bid on ebay just before Christmas - the Count, River2 and CSnC for $24 Buy-it-Now! Amazing, what a great find! But I don't have enough money in my paypal account to buy it today (and I can't use a credit card because I don't have one from one of the listed (EU) countries). So I have to wait a day or two until my paypal account is topped up, so it will be a bit of a nervous wait for me. Really I only want it for the Siege tiles, even though I already have the Cathars and the Besiegers, because this is one of my favourite concepts in the whole series. That's an interesting/strange store. They are selling King, Count and Robber for €11.99 but the River II by itself costs €24.99! The River II is the imported RGG version but really, there's no point acquiring it and selling it for that price when you're already selling CK&R.